In World War II, if someone supported Nazi Germany at the expense of the United States, we didn’t say that was freedom of speech, we put them in a camp. They were prisoners of war. So, if these people are radicalized and they don’t support to the United States and they are disloyal to the United States as a matter of principle — fine, that’s their right. It’s our right and our obligation to segregate them from the normal community for the duration of the conflict. And, I think we’re going to have to increasingly get tough on this, not only in the United States but our allied nations like Britain and Germany and France are going to have to look at their domestic law procedures. What Wesley Clark is saying here might sound reasonable (actually, no, it doesn’t), but this is the exact same reasoning that propelled President Roosevelt to sign Executive Order 9066, which eventually led to the forcible incarceration of over 100,000 mostly Japanese American American citizens and families; only a small fraction of those incarcerated — just over 11,000 — were German nationals, representing less than 1% of the country’s German-born population. Clark’s invocation of Nazi Germany in his discussion of World War II incarceration camps is a red herring: when we talk about World War II incarcerees, we are talking about Japanese Americans. Clark suggests that forcible incarceration of American citizens today would be somehow justified because of concerns regarding disloyalty. Yet, the same loyalty question served as the chief justification for the incarceration of Japanese Americans during the 1940’s — Japanese Americans were believed to be a sleeping “fifth column” of potential Japanese spies and militants, despite an overabundance of evidence now showing that this theory was completely unfounded. In particular, Japanese Americans were classified as “enemy aliens” because many remained Japanese nationals: yet, this wasn’t a question of loyalty. Rather, this was a consequence of racist immigration laws that prevented non-White immigrants from naturalizing as American citizens: a third of Japanese American incarcerees remained Japanese nationals because they literally could not give up their Japanese citizenship. Nonetheless, to shore up the rationale for the camps, a loyalty questionnaire was administered to incarcerees in 1943 designed to rate Japanese Americans based on their degree of “Americanness”; in practice, many of the questions were confusing and insulting. Those who responded — by accident or by choice — in an unpreferred manner were deemed “disloyal” and shipped off to the harshest and most inhumane concentration camps, where they lived in ramshackle huts under the unrelenting watch of armed guards. These are the camps Wesley Clark believes need to be revived. But, before we argue that he only wants to house known terrorists in them, we can again turn to the lessons learned during World War II: when the federal government builds camps to house potentially disloyal “enemy aliens”, a very small minority will be imprisoned following due process analysis of their actions and ideology. The vast majority of those incarcerated will find themselves forced behind barbed wire based on their superficial resemblance — whether with regard to race or culture or religion — to those with whom we are at war. Presumed disloyalty will be the stated reasoning, but this will be nothing more than an empty, unsupportable rhetoric. In actuality, incarceration camps have never been anything more than a mechanism by which xenophobic racist stereotyping and fear becomes manifest to condone the institutionalized victimization and terrorism of members of the (non-White) citizenry. In the 1940’s, the victims were Japanese American families. In Wesley Clark’s near-future America, it would be Muslim American mothers, fathers, and children. What should be even more frightening to us is this: despite the federal government’s subsequent apology for the World War II-era concentration camps that imprisoned over a hundred thousand Japanese American citizens, the federal government has never formally declared such camps unconstitutional. Incarceration camps remain a legal tactic by which the federal government could forcibly imprison thousands of its citizenry without due process. 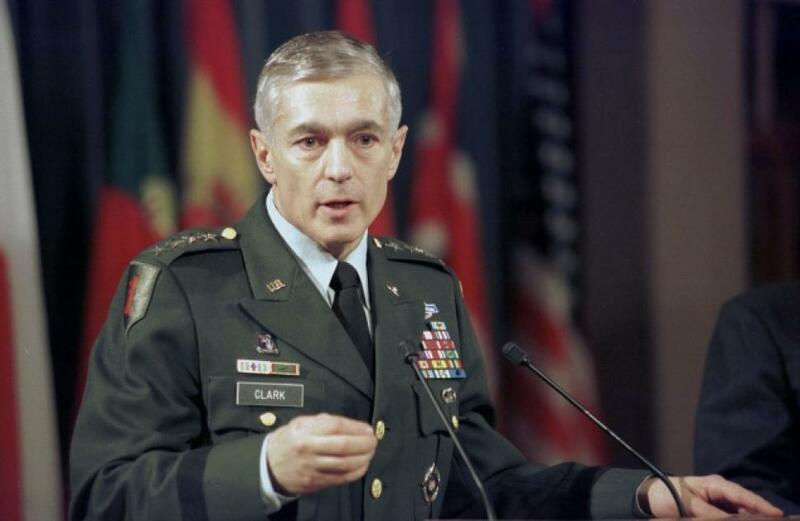 General Wesley Clark’s call for internment camps for “radicalized” Muslims is troubling. In 1988, the United States apologized to Japanese Americans for the injustice of summarily incarcerating our community during World War II. It was a time of fear and backlash toward Japanese Americans stemming from causes even beyond race. The true character of a nation is evident during troubling times when our security, real or imagined, is threatened. In 1942, the threat of an internal enemy was made to appear real when our government knew otherwise through findings from the FBI and other intelligence agencies. As a result, 120,000 Japanese Americans were forced from their homes, dispossessed of their property and confined in concentration camps located in remote and desolate places. This action ignored due process and equal protection, rights guaranteed by our Constitution. The threat of terrorism is real, but we must remain circumspect about the solutions we pursue. The apology to Japanese Americans says that we owe it to ourselves, to our own sense of honor that we do not go down a path that jeopardizes the rights of Americans. A response of mass segregation was wrong in 1942, and is no more right today.